In December the Rutles are coming to Blu-Ray. The Rutles, the legend that will last a lunchtime! The Rutles, the Prefab Four! The Rutles — Ron, Dirk, Stig, and Barry! The Rutles, four loveable moptops from Liverpool who conquered the musical world and discovered tea! The Rutles were the creation of Eric Idle and Neil Innes. After Monty Python, Idle created a new program, Rutland Weekend Television, and on that program there was a skit about the Rutles, a fictitious band whose career and music eerily paralleled the Beatles. In 1978, a television film was made, All You Need Is Cash; Idle wrote the script, Innes wrote the music, and the cast included members of Monty Python (Idle and Michael Palin), Saturday Night Live (John Belushi, Dan Ackroyd, Bill Murray), and George Harrison. The film was utterly riotous, the soundtrack album was brilliant (and the subject of a lawsuit by the owners of the Lennon/McCartney songbook). In 1996, in the wake of the Beatles’ Anthology project, Innes reassembled the musical Rutles — himself, Ricky Fataar, and John Halsey — for a new album, Archaeology. A few years after that, Idle recut All You Need Is Cash with new footage of musicians and actors reminiscing about Rutles for the new film, Can’t Buy Me Lunch. 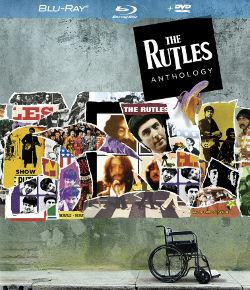 MVD’s Rutles Anthology brings together the two Rutles films on Blu-Ray, along with the original Rutland Weekend Television sketch and a new documentary with Idle. Of the two films, only the first is essential. The second tells the same story, with the same footage, but with new interviews about the Rutles and their effect from people such as David Bowie, Tom Hanks, Carrie Fisher, and many more; it’s watchable, but nothing original if you’ve seen the first. That said, the first is a necessary part of any Beatle fan’s film library, and I wholeheartedly endorse picking it up this December. While you wait, explore The Rutles: LUNCH, a fan-created mash-up album in the style of The Beatle’s LOVE, and read my thoughts on the album. Or, read “Ouch!,” a brief Doctor Who/Rutles story I wrote on the train a few years ago. Next Next post: Dracula Has Risen from the Grave!